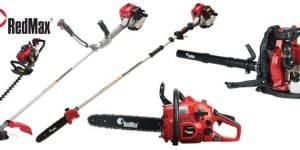 The Stihl brand manufactures a wide variety of outdoor power equipment, seeking to meet the needs of every customer, no matter how big or small their job is. 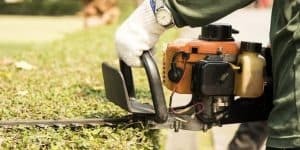 This equipment includes but is not limited to chainsaws, grass trimmers, leaf blowers and hedge trimmers. Under the Stihl name, you can also find edgers, pressure washers and sprayers. All of this combines into a grand total of over 260 variations in the models they have available. With so many different kinds of tools, you’re sure to find exactly what you are looking for whether you need it for home, work, or just the occasional use. If you find you’re having trouble choosing the right tool for your needs, you will also find a helpful interactive product selector on their website to guide you through the process. 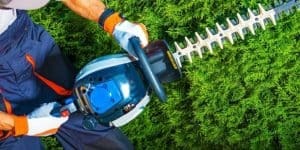 When shopping for a hedge trimmer, there are so many options and brands available for you, it’s important to know a little bit about what makes each brand tick. In making a big purchase, you want to know you’re buying something that will be useful and long lasting. 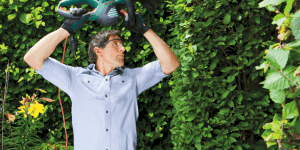 In an effort to meet that need, Stihl has developed four different kinds of hedge trimmers, including those you might need for home or professional purposes. They also carry battery operated trimmers; that way you have the freedom of movement without having to drag around a cord wherever you happen to be working. 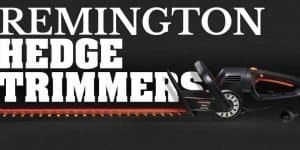 Many of their hedge trimmer options come with dual blades, as well as specially designed handles in order to provide maximum comfort and efficiency. 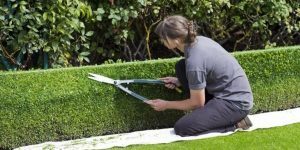 What’s better, corded or battery powered trimmers? Read it here. 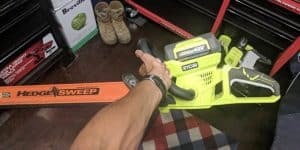 Stihl was first created in 1926 by Andreas Stihl, which is also the year that the first Stihl chainsaw was developed, which weighed a hefty 106 lbs. and was meant for two people to maneuver together. That’s quite a bit different than the one-person chainsaws used today. Stihl had hired its first twenty employees by 1929. In 1971, Stihl was a leader in the chainsaw market. Opening its doors as a business in 1974, the company started in Germany but developed their first American sales office in 1975 and a manufacturing plant in 1977. By the time 1981 rolled around, they were already opening their second plant in the US. Not long after that, they began selling Stihl apparel. Since that time, Stihl has only grown into the well-known name seen in stores today. 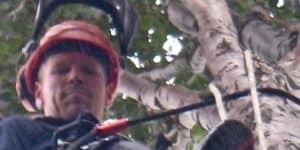 Between their very first chainsaw and the incredible range of products today, Stihl’s products have become a common name in power tools as well as outdoor machinery. In more recent news, Stihl celebrated its 90th anniversary in 2016. Having the quality of service and products to last nearly a century is no small feat. In 2015, Stihl introduced the electric-start backpack blower, which at that point was the only one of its kind in the world. 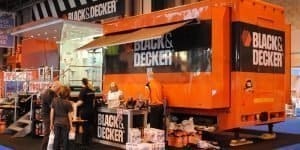 Not many companies can boast having created the first of a product at the global scale. 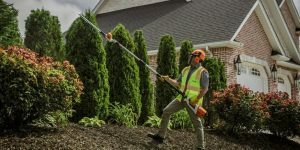 All this success has allowed Stihl to grow into a truly massive company, complete with products that are being sold by more than 9,000 retailers all over the US. The demand for this kind of equipment is sure to only grow in the future, and move toward a more environment-friendly route. Creating machines that have low to no emissions will be a valuable step in allowing companies like Stihl to continue to flourish. Don’t miss out on our extensive review page here. The HS 46 C-E is a lightweight, gasoline-powered trimmer. It has an anti-vibration system designed to make the work easier on you, and double-sided blades created to help make the job quicker and more efficient. Like many other Stihl products, it was made in the US. This trimmer also has an easy-to-start feature, allowing you to save the hard work for the actual trimming. Fuel efficiency also makes this trimmer incredibly useful. 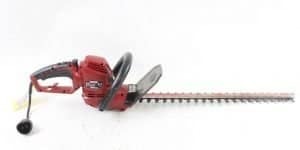 It weighs about 9.5 lbs., making it lighter than many other hedge trimmer options; it has a 22” blade length. The HSA 66 is a battery-powered trimmer, meaning you won’t need to drag around a cord everywhere you go. Its lithium ion battery is designed to work in all Stihl battery-powered tools and remain strong until the battery has been fully drained. It has a two-handed design with a loop handle that allows you to drive the trimmer in any direction. It also comes with a blade scabbard as well as a tip protector so that it is safe when not in use. This trimmer also has a special slot to allow it to be hung vertically, making it easier to store. The HSE 70 is special in that it is built with technology designed to reduce the emissions this trimmer creates; that makes it a more environmentally sensible option than a lot of others. It also sports a built-in cord retainer, making cord storage easy and fast, as well as laser-cut diamond-ground blades. On top of that, the lightweight and well balanced design of this trimmer is sure to make it a winner. This trimmer weighs about 9.9 lbs., making it just slightly heavier than the HS 46 C-E, but not by much. Finally, the HS 56 C-E comes with a 24” blade complete with a tip guard to keep the blades protected. It has an anti-vibration system to help keep everything steady while the job is being completed. It is easy to start and comes with dual-sided blades meant to allow the trimmer to easily work in multiple directions. This model is lightweight at a mere 9.9 lbs., and easy to start with a quick pull of the cord. It has a fuel capacity of 280cc.